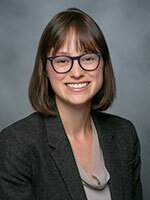 Halley Ruppel, PhD, RN, is a Delivery Science Informatics Fellow at Kaiser Permanente Northern California’s Division of Research. She received a BSN from the University of Pennsylvania, an MS in Nursing Education from New York University, and a PhD in Nursing from Yale University. Her clinical background is in pediatric critical care nursing. Ruppel’s research interests focus on understanding and improving the use of technology and data in acute care settings to improve patient safety and quality of care. Her recent research focused on clinical alarm management and reduction of alarm fatigue in intensive care units.